Maine’s Department of Environmental Protection needs to be run by a scientist with environmental science expertise. Effective environmental protection is essential to Maine’s largest industry, tourism, as well as its natural resource-based industries of fishing, forestry and agriculture. Maine’s Attorney General’s office has statutory authority to represent all governmental entities, including agencies, in legal matters, whether as plaintiffs or defendants. Duplication of the AG’s legal expertise is unnecessary within the DEP. Importantly, we need to begin to restore citizens’ trust in government by data-driven decisions that honor the best nonpolitical, nonpartisan knowledge available. Also, repair of the diminished morale of the department’s able staff can be led by science-based, rather than the previous political-ideology-based, management. Recent experience within the DEP’s rulemaking on metal mining issues shows major rule changes made without scientific justification and an embarrassing lack of understanding of the technical complexities of the issues. The legislative policy committee demonstrated its inability to access scientific expertise in its rush to enact current law that violates the laws of physics with regard to groundwater contamination. Having scientific expertise at the head of the DEP does not guarantee good policy, but continuing in the mode of scientific ignorance cannot be helpful. Legislators on the policy committee that makes recommendations on confirmation, and state senators who will vote on such confirmation, should quickly encourage our new governor to withdraw Jerry Reid’s nomination as DEP Commissioner (without prejudice) and replace it with an expert scientist. “I’m in a healing mode,” he added with a smile. One issue Chapman hoped to address was metal mining. A resident of Brooksville, home to the ongoing Superfund site at the former Callahan Mine, and a neighbor to Blue Hill, site of the former Kerramerican Mine, Chapman worked to pass legislation that would prohibit groundwater contamination from metal mining. Chapman encourages participation in state and local government in all forms, from voting to running for office. Good morning from Augusta, where the newly seated Maine House of Representatives includes five people who don’t identify as either Democrat or Republican. Some call this decentralized system “ecological socialism,” “communalism,” or “the cooperative commonwealth,” but whatever then terminology, we believe it will help end labor exploitation, environmental exploitation, and racial, gender, and wealth inequality and bring about economic and social justice due to the positive effects of democratic decision making. Production is best for people and planet when democratically owned and operated by those who do the work and those most affected by those decisions . . . not at the whim of centralized power structures of state administration or capitalist CEO’s and distant boards of directors. I personally like the phrase “ecosocialism,” but not everyone does, so objections to it must be raised and addressed honestly. I can think of two principal related reasons why some object. First, when some people hear the word “socialism,” they still flash on the late-stage Soviet Union, as if that were the only possible model, but this response short-circuits thinking before it can get off the ground. The second reason is related because it assumes that it will be too hard to overcome the first objection among other people, even if one is comfortable with the term. If we regard corporate globalism as the chief enemy of the people of the world, and as left activists, we must do so, then surely we ought not to be timid in using a term that unequivocally challenges that hegemony, namely socialism. However, it is incumbent upon us to clearly define what we mean by socialism, and not let false narratives be put in our mouths. We need to invent a form of socialism that not only can replace the dominant feudal-like corporate structures we detest but just as importantly, be culturally acceptable to the general public. In the USA, of course, this is a challenge, but one we are capable of handling. The Green Party platform description goes a long way toward clarifying our intent. Despite ideological resistance, even the strictest libertarian is not threatened by the existence of a cooperative health food store, or the municipally run library, though they can be termed socialist structures. Why? Because there is no government coercion! But what if these cooperative enterprises were the dominant structures? What if we could have a referendum to yank the corporate charters of the most objectively malevolent mega-corporations—the ones that grossly offend the environment, human rights and practice extreme labor exploitation? What if we declared, as the ultimate collective sovereigns (remember “We, the People declare our own Constitution) that these offenders had not more than one year to sell off inventory and dismantle themselves or their Boards of Directors would be arrested for such crimes as poisoning the air, soil, and water, along with various fraudulent representations, and their corporate assets seized? If the products and services provided were truly needed, they could be produced under terms consistent with ecosocialist values. We need to re-activate the original intent definition of socialism to mean “control by the working class” including those currently not employed—all those who have nothing to sell but their labor. This involves expropriating the expropriators. It does not mean, of course, killing them off or wholesale imprisoning them, although some cases must undergo careful evaluation in that regard. The word “socialism” is a defiant repudiation of the rule of capital which now has a stranglehold not only on “the” economy (as if there could only be one!) but on all three branches of this government, and of the pervasive culture of commercialism. Some will object, with good reason, “What about all the employees who are displaced? They would rather work under exploitative conditions that have no income at all!” Of course, we need to plan ahead to provide at least equal if not better compensation from the moment of dissolution. We can do this! There is work to be done until everyone has sufficient housing, food and water, energy supply, health services, and educational opportunities. Once we have achieved this, then we need to apply this test to the rest of the world—no end to the need for labor, once we reject the notion that only when a profit is to be made by the capitalist class, shall there be a demand for labor! Bad premise! It is a matter of re-allocation of resources away from a war economy and mega-profits fora few to humane objectives. It will be the responsibility of a Green eco-socialist government to facilitate this transition. Will we allow private business? Indeed, for this is where we see the rewards of innovation via entrepreneurial energy and the motivation to invent. But these enterprises need to be run within the context of reasonable ecological and human rights parameters and at a scale consistent with local supervision. Instead of positive socialist features within the context of an overall capitalist economy (e.g. the Scandinavian countries), we do just the opposite! We allow creative small businesses to operate within the context of a decentralized cooperative economy. Not everyone wants the responsibility to be an owner or manager and will be satisfied to work for an entrepreneur, under humane and generous working conditions. We need to terminate conglomerates by outlawing one company owning another company, though it may be permissible for one family to own more than one small business. Needless to say, as part of this radical change, we need to break up the huge media complex that dominates news coverage that increasingly is hardly respected, and appropriately so! We have to encourage honest journalism that feels no need to self-censor due to the need to conform to the value system of upper levels of corporate management, including CIA infiltration (note: Operation Mockingbird). 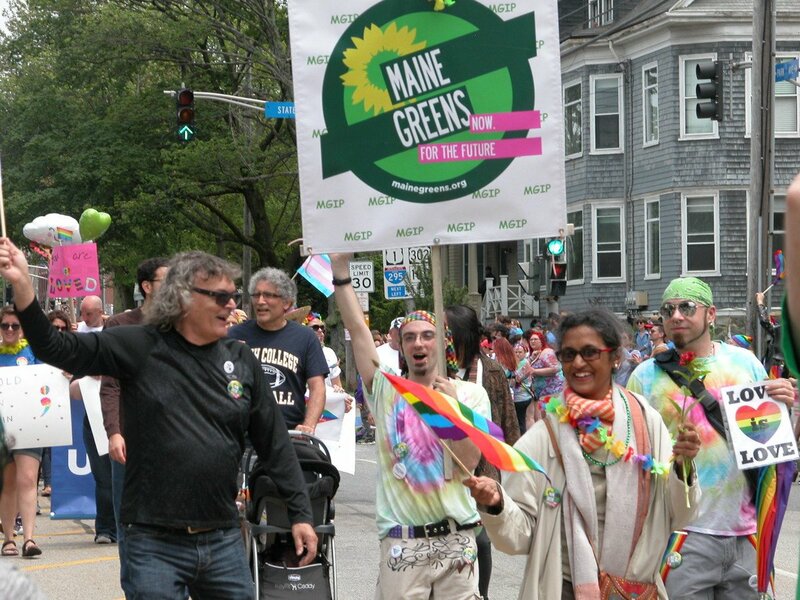 Jon Olsen is co-chair of the Maine Green Independent Party. He is a long time peace and justice activist and a Green Party member for 30 years. A graduate of Bates College in Maine with a degree in philosophy, he went to the University of Hawai’i for a Master’s Degree in the same field. He returned to Maine in 2001, serving twice on the Steering committee of the Maine Green Independent Party. He has conducted town caucuses and gathered signatures for Green Party gubernatorial candidates. His recent book, Liberate Hawai’i, describes the legal and historical research done by Hawaiian scholar-activists. The book documents the illegal claim of the US to the sovereignty of Hawai’I and demonstrates its fraudulent nature as well. Olsen draws a parallel with the similar fraudulent attempt by the late USSR to do the same to Lithuania.